has a most excellent interview up at her site with Kristin Cashore AND the publisher is offering 10 Graceling books as a giveaway! Miss Erin in a MOVIE! "I AM GOING TO BE IN A MOVIE. MY FIRST FEATURE FILM EVER. THE CAST AND CREW (myself included, obvi) WILL BE FLOWN OUT TO KENTUCKY IN JULY TO SHOOT ON LOCATION. THE MOVIE WILL BE DIRECTED BY GLENN WITHROW. IT'S GOING TO STAR HALLIE TODD (!!!) AND MYSELF WITH A GROUP OF OTHER GIRLS. If you've been reading this blog for awhile, you'll know that those are two of my favorite people (and heroes/mentors) on EARTH. THE MOVIE IS CALLED "THE MOORING" AND IT'S A HORROR-THRILLER." Here's a roundup of all of Laura Resau's discussion posts for Red Glass this month. Feel free to jump in and add your thoughts at any time! Thanks again, Laura and rgz! Have you ever taken a trip that changed your life? Clothes or jewelry that make a difference? Helping me close out this month's family series are siblings Micol and David Ostow. That pretty much set the tone in our relationship from childhood through the college years.2 I'm not sure what changed exactly, or when, but these days my brother is not only my writing partner3 but also one of my very best friends. And I have learned that a bonus in working with a partner who also happens to be your brother is that you are granted carte blanche to occasionally revert to your five-year-old self amidst times of stress. I disagree with Micol. Family does not have to love you. My very unscientific observations suggest that the odds of being born into a community of people who are prepared to love you for who you are and who – in their tolerance – deserve the same, are fairly slim. For better and for worse, we Ostows have beaten those odds. For better because the freedom to pursue our chosen paths has given Micol and me not only a clear perspective on our own selves, but on one another as well. And it turns out we're not so different. Our shared sense of entitlement, cynicism to the world at large, and tendency to laugh at the expense of others are the keys to any success with which So Punk Rock is met. Without the opportunity to harness all this negative energy and to deflect it outwards, Micol would still be throwing blunt objects at me – as she did when we were children - and I would still be sleeping with one eye open. Luckily - and perhaps in anticipation of this - our parents bequeathed to us another long-standing Ostow family institution: Therapy. Follow the series of family posts. Having Laura here this month has been inspiring. 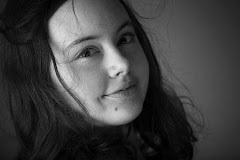 Thank you, Laura, for hanging out with readergirlz!! All month long, Turner Classic Movies has spotlighting Latino Images in Film as part of their Race & Hollywood series. In addition to airing an amazing lineup of classic and contemporary films featuring Latino actors and cultural storylines, they have also taped interviews with actors such as Edward James Olmos, Hector Elizondo, Rita Moreno, and John Saxon. I absolutely loved the interview with Rita Moreno, in which she discusses stereotypes and getting (or not getting) certain roles. Watch the video with Rita. Visit the Latino Images in Film website. Written entirely in blog posts and status updates, GoldenGirl is definitely a modern story. Describing the lives of girls who would normally be upper class boarding school snobs, the blog aspect made the characters easy to understand in a way I've never experienced before with the 'mean girl' character. Being inside Spencer's head gave me a chance to learn what she was really going through and why she acted the way she did. Neatly enough, the story doesn't end when the last page is turned, and no that's not just because book two is coming out soon - Bradford Prep continues online. The very blogs mentioned between the covers actually exist on the internet with additional information from the characters. Most of the girls even have Twitter and Facebook accounts too! Not only is the story fun to read, but it's interactive to boot. Take a look at bradfordprep.com for a peek, then read the book for yourself. Attention writergirlz: Summer Revision Smackdown! Hey readergirlz: are you writergirlz, too? Have you written a story and need a licorice lash to get going on revision? If so, you're invited to come on over to diva Holly's blog for the Summer Revision Smackdown! Post your goals, crack the whip alongside some fabulous writers, get tips from the experts, and win prizes! See the Smackdown post for all the details on how to participate. I hope to see some of you there! Pets: Half-corgi-half-lab named Luli. She's short and long and bratty - she gets lots of laughs. Dream book tour: How about a series of candlelit readings in remote caves around the world? Getting there would be an adventure for everyone. Favorite outfit: A très chic strapless silk dress I discovered last summer at a street market in Aix-en-Provence, France. Always looking for excuses to wear it — not easy here in Colorado -- the land of Polarfleece and Tevas. WOW. I so want to meet Laura's dog, write in her rig and go to her candlelit cave readings (maybe even wearing her strapless dress). You guys? Find out more on readergirlz.com! 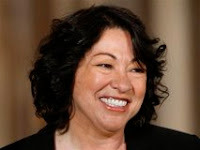 Quick note: How cool is it that the new Supreme Court nominee (federal appeals court judge Sonia Sotomayor, left) is Latina, and during our big month celebrating Latin culture? Readergirlz and President Obama = same wavelength. It's history making! The literary family that I've adored continuously - from childhood to the present -- is J.D. Salinger's Glass family. I still really love that one footnote in Franny and Zooey" that describes each of the seven children: Franny, Zooey, Walter, Waker, Boo Boo, Buddy, and of course, Seymour. When I was at Cambridge, I wanted to stage a play based on 'Franny and Zooey,' but then I heard that Salinger sues the hell out of anybody who tries to dramatize anything based on the Glass family, so that was that. I was amazed, then, when Wes Anderson dished up a remarkably similar family of child geniuses in his film The Royal Tenenbaums -- and came through it unscathed by Salinger's legal team. I loved the Tenenbaums with as much gusto as I loved the Glasses - from Margot with her play dioramas to Chad with his dalmation mice to Richie with his ballroom of paintings. If I had to put my finger on what attracts me to these families, I'd have to say it's their combination of unbridled creativity and utter dysfunction. The narrative of enormous-yet-squandered brilliance and potential has always been very interesting to me, and I explore it a lot in my own writing. The Glasses and Tenenbaums have also been a big influence on me as I've created my own child-savant characters in my books: Cornelia in Cornelia and the Audacious Escapades of the Somerset Sisters is an expert in words; Franny in The Rising Star of Rusty Nail is a piano prodigy; and the title character in Tennyson is an uncannily sharp writer whose talents belie her age. The Teen Author Carnival in NYC THURSDAY May 28th! Some very Awesome YA fans, those of the aptly named Five Awesome YA Fans ning, have put together quite a carnival of teen authors. So if you're in NYC this Thursday from 4-6pm, stop by the Jefferson Market Branch of the NY Public Library ( 425 Avenue of the Americas) and party with us! Who's on the guest list? See below. I can't tell you what the categories mean... 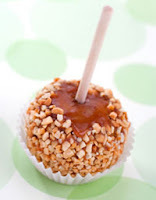 I haven't found out myself (Though I'm glad to be a Caramel Apple). What I can tell you is this: It's going to be F-U-N. Come! Every meaningful relationship is born of, and returns to, trust. Family, for me, is composed of the people whom I trust. So that my husband, son, father, and siblings are there in my heart home, absolutely. But so are those with whom I dance two times a week - the teachers with whom I feel free to make mistakes, the other dancers who yearn as much as I do. Sometimes I don't even know what we are all yearning toward - I can't name it or define it. But I look around and I understand that we are all in that same wanting place, and that we trust each other, and that the conversations we are having, the lives we are living, will be tangled up together for a long time. That we are, in other words, family. One theme in The Little Prince quotes in Red Glass is that what's essential is invisible. Can you think of a time in your life when you had to look past surface appearances to find what was most important? Have you ever made an assumption about a person, and then, after you've gotten to know him or her, had a different impression? Peace, Swings, & Book Giveaways! I dared author Lauren Myracle to describe her newest book, Peace, Love, & Baby Ducks, solely in song titles - and she did! Only she didn't list the arists - just the songs - to test my song-recognizing prowess. Do YOU recognize the songs and know who sang 'em? Read my interview with Lauren Myracle, figure out who sang what, and then leave a comment with your guesses before midnight PST on Sunday, May 24th. One random commenter will receive a signed copy of Peace, Love, & Baby Ducks. Good luck! Update: Congratulations to Jenna, who was selected to be the winner! View the complete Peace, Love, & Baby Ducks playlist. Fellow postergirl HipWriterMama is, thanks to Candlewick, giving away 10 sets of Jo Knowles' two novels, Lessons From a Dead Girl and Jumping Off Swings! Leave a comment at her blog (after reading the awesome interview and the rules!) before Friday, May 29th. I have always thought of family as reaching beyond genetics and including friends. Several years ago, I realized family was even more. My husband and I lost our first daughter at birth, and I have never seen such an outpouring from our families, friends, colleagues, writing community, neighbors, and complete strangers. They called and visited. They sent cards. Meals. Flowers. Books. Every expression of kindness imaginable, to let us know we were not alone. When I think of that time, I think as much of the love as I do of the sadness. Now I know: a family is defined by love. Brian Leaf, author of Defining Twilight: Vocabulary Workbook for Unlocking the SAT, ACT, GED, and SSAT (Wiley), is hosting a contest that sounds pretty darn cool. Your job is to write a creative essay of no more than 1,000 words that incorporates the eight words listed on Brian's contest page. You can write Twilight fan fiction or an entirely original essay. Each essay will be judged based on: correct and effective use of the eight vocabulary words, creativity, clear communication of ideas, correct syntax, grammar, spelling, and punctuation. Oh yeah, it's serious grammar time. There are three age categories and five winners in each category. (First prize is $500 and a copy of the book; second prize is $50 and a copy of the book). Deadline: Essays are due on or before Friday, July 31st. Good luck, readergirlz! Find the full rules and info here. Sophie is blessed to know and love Dika, an older woman with a zest for living and complete acceptance of her body. Dika has lived through immense trials, but she has a joy for the day she's been given. Do you have anyone in your life like Dika? Psst: what does she look like? "I didn't even think about the cover while I was writing this book--firstly because it wasn't contracted so my main concern was to get it finished (without getting eaten by zombies) and then hope that my agent might be able to sell it (and yay--she did!). The other reason is that I'm really not a very visual person so it's never been part of my process to think about what the finished product might look like. "My editor told me that even though the book was quite light and humorous they wanted to go for a slightly darker cover, which I was totally up for! The only idea I had was a girl sitting in a frothy/tulle sort of prom dress, with loads of zombie arms trying to grab at her legs. I still think that might've been cute but I much prefer the way it turned it out. "When I first saw my cover, words failed me--that's how much I loved it. And every second I would look at a different part and decide that was my favorite bit. The wilted corsage. The lacy gloves. The black nail polish. The amazing dress (which by the way, I actually wrote into the story. At first Mia wasn't too happy at having to lose her gorgeous blue silk dress but as soon as she tried the new one, she was cool!). "However, I think my absolute favorite part is the B-grade zombie movie font that was used on the sash. The whole reason I wanted to write a zombie movie was because every time I even said the word I thought of all the old zombie horror movies that my husband had made me watch. So to me that really captured the essence of the idea (not that the designer had any idea of this of course, but it's still cool!)" I have to say, I LOVE the dark, goth style corsage that Mia has on. What do you guys think of this cover? WHAT? Are you kidding me. Bring it on, rgz. ADAM is my American Idol. Period. Exclamation point! What in the world happened? I called for 1 1/2 hours last night! Diva Lorie Ann is having a very sad moment here, peeps. Here's to Adam. My American Idol. Welcome to rgz LIVE! Jump into the party with Laura Resau, the divas, postergirlz, and rgz. Let's celebrate Latina month! In Red Glass, Sophie encounters an extremely gross bathroom on her solo trip into Guatemala. She runs outside and ends up laughing hysterically. Why do you think she does this? What's the most shocking (or grossest!) place you've encountered? How did you react? Have you ever had a completely unexpected reaction to something? 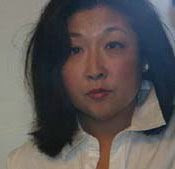 The National Book Foundation has announced the twenty writers who will serve as judges for the 2009 National Book Awards. These writers are from all across the country and represent a variety of backgrounds and diverse writing styles and include National Book Award Winners and Finalists, two Pulitzer Prize winners, a PEN-USA Award winner, a Whitbread Prize winner, and recipients of Newbery Honors and the Michael L. Printz award. Woohoo! Let's give it up to these fantastic writers for their service! We can't wait to see the finalists! "The Guys Lit Wire Book Fair for Boys to benefit the teens held in the LA County Juvenile Justice system is still rocking along! We really appreciate all the help we have gotten thus far and hope that folks will continue to share the link and let those who are unfamiliar with our project know about what we are trying to accomplish. Please read my earlier post on our partnership with InsideOut Writers in LA and how to access the Powells Wish List. Did a book change your life? Well now's the time to pay that literary favor forward." I just bought Jacqueline Woodson's Locomotion for the teens. It's awesome having the chance to contribute. Just visiting the Wish List is very interesting. So many are affordable, btw. A few days ago, the two-year-old son of one of my dearest friends was rushed to the hospital. (Before I go any further, let me just tell you that the baby is fine; he got an absolutely clean bill of health.) Moments after the ambulance came, my friend's husband called to tell me what was going on. I dropped the phone, ran outside, got a cab, and raced to the hospital. On the way over, I started to think about what I would tell the receptionist at the ER. I desperately wanted to be with my friend and her son, and I was afraid the emergency room staff wouldn't understand that we were such close friends that really we were family. The thing is, I've always had a really broad definition of family. I don't think you need to share DNA or be legally related to someone to be their family. Tonight, just before I sat down to write this, I looked the word "family" up in the American Heritage College Dictionary. It was a pretty long entry, so I'm not going to reproduce the whole thing here, but this was my favorite part: "Two or more people who share goals and values, [and] have commitments to each other. . . ."
There are a lot of people in my life who fit this definition, people who are my family in the truest sense of the world, people for whom I am grateful every single day. When I got to the hospital, I went straight back to the pediatric ER. I spotted my friend sitting on a gurney, the baby asleep in her arms. I sat down next to her, just like I belonged there. A few minutes later, a nurse came over to take the baby's vital signs. He woke up and started to cry. "It's okay,” the nurse said. "Settle down. Your family is here." Yes, I thought. We are. Laura Resau's rgz LIVE chat is coming up this Wednesday, and we've got a new graphic to prove it! Grab and repost this graphic, and spread the word! We'll be posting rgz LIVE featured book graphics like this every month, so get ready to tell your friends and chat live about great books! Joining readergirlz is simple, really. All you need to have is the love of reading - and the book of the month, of course! Get the book from your local library or bookstore. Then, as you read it, discuss it with other readers right here at the readergirlz blog. Simply put, readergirlz is an interactive book group, open to all ages (and both genders - we do have readerguys!) But it's so much more than that. Reading a book isn't the same thing as experiencing a book. We want you to read, reflect, and reach out. That's why, every month, we pick a book which features strong, gutsy girls, then go beyond that. We recommend additional titles (see below for our postergirlz picks) and inform you of outreach programs that tie-in to the book we're discussing. Every issue also has an exclusive interview with the author of that month's book as well as a playlist created by the author, discussion questions, and tips on hosting your own book group. Want to see what books we've spotlighted and discussed before? Browse through our archived issues. This month, we're discussing Red Glass by Laura Resau. It's a perfect fit for both this month's theme of Family and for Latina Book Month. Find out more about the book by reading the May issue of readergirlz and the Red Glass roundtable discussion between me (Little Willow), Shelf Elf, Lorie Ann Grover, and Holly Cupala. Many thanks to diva Holly Cupala for the header of amazingosity! Now everyone can see exactly what we are talking about for the month. And how cute is this baby slideshow I found for the sidebar? We'll have the postergirlz fab recommends showing all month! Let us know if you have any thoughts to improve our community at divasatreadergirlzdotcom. May: Red Glass Party Ideas! Wanna host a book party in honor of Red Glass? Laura Resau has some ideas for a colorful, musical fiesta! Food: Mangos, fruitcake (um, if you're not into fruitcake, how about quesadillas? ), red Jell-O -- and lime juice squeezed over EVERYTHING! 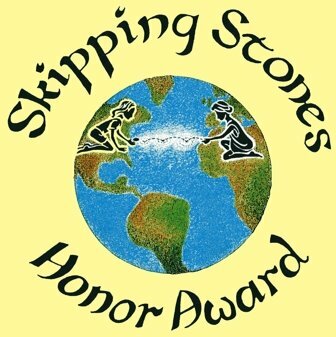 Mitali Perkins as been given an Honor Award from Skipping Stones Magazine. "This is one of those awards that dovetails with my personal vision as a write', honoring books that 'promote cooperation and cultivate an awareness of our diverse cultures." Thank you, Skipping Stones!" Give it up for Mitali, rgz! 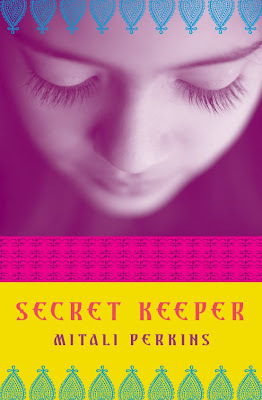 We love Secret Keeper, and our rgz Talent Scout! Justina is a Hometown Hero! Cheers for Girls Write Now! Lovestruck Summer Release Day Contest! May: What have you overcome? Yay for the Blatant Bibliophiles!